Where possible, find a chair and desk which suits your child’s height and their feet can touch the floor. Ensure your child pulls their chair close to the table and positions their book or paper in front of them. Their feet should be positioned flat on the floor, with hips at 90 degrees. Elbows should also rest at 90 degrees to avoid shoulder elevation and strain. Remind your child to engage the muscles in their core (tummy) and sit upright as best they can. 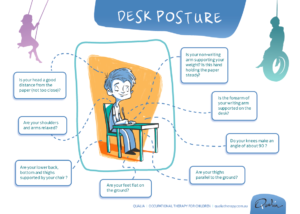 Keep head, neck and spine in neutral position and avoid having head leaning in close to the desk. For children with a right-hand dominance, position paper to the right of the child’s midline with the top right hand corner angled higher. For children with left-hand dominance, position paper to the left of the child’s midline with the top left hand corner angled higher. Encourage your child to use their non-dominant hand to stabilise the paper. Mix up writing tasks by writing on vertical surfaces such as whiteboards and blackboards, or laying in prone whilst propped on elbows. 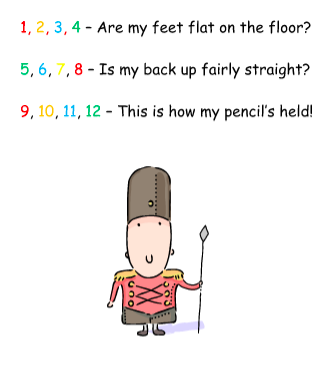 Use this clever rhyme before writing to remind your child of their posture ?